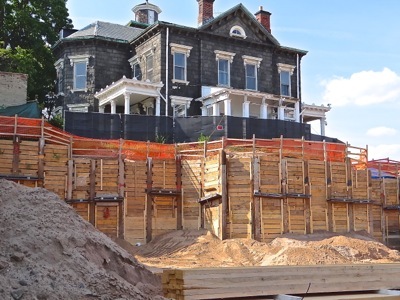 Special Section Dedicated To Our Coverage Of The Steinway Mansion In Astoria. 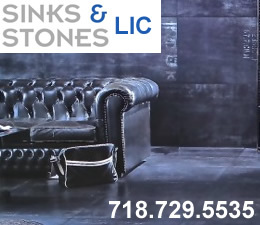 Updated April 2017 / March 8, 2014 / NYC Neighborhoods & History NYC / Gotham Buzz NYC. Queens Buzz didn't expect to become so engrossed in one issue so soon in its development. But the sale of the Steinway Mansion represents the preservation of perhaps the most important remaining remnant of 19th century Queens, and is attached to the legacy of a family that was influential in shaping the borough of Queens. The more we dig, the more we find, so stay tuned as this section will likely double in size sometime in 2011. And in following the stories we write, you'll obtain greater insight into Queens history, the Steinway & Sons legacy and the emergence of the borough of Queens to become the largest borough in New York City. These stories are presented chronologically, starting with the most recent posting. September 12, 2016 / NYC Neighborhoods & History NYC / News Analysis & Opinion / Gotham Buzz NYC. On May 3rd, 2014 the Halberian Family sold the Steinway Mansion to Steinway Mansion LLC for $2.65 million. In the two and a half years since, the new Steinway Mansion owner parceled the property into a eleven additional smaller lots and built eleven two story commercial buildings on each. 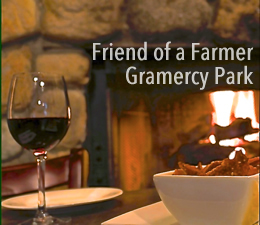 We watched as the owner quietly developed the property, likely in line with his plans while making the investment. Just over a year ago I visited the site and took some photos, which momentarily revealed the resplendent glory of the old mansion, overlooking the East River and distant Rikers Island and Bronx shores. The new owner had cut away most of what remained of the Steinway Mansion yard to make way for the new buildings at a height on a level with 42nd and 41st Streets. The construction site seemed well maintained and the historic mansion structure appeared to be treated respectfully both last year, and as I learned in my most recent trip, also since. The photo above was taken in August of 2015. Last weekend I returned to the site to shoot photos and see what was happening. I came in along 42nd Street, and for a moment I wondered if I had gotten my coordinates wrong, as the street had been transformed. The emptiness on the street of the construction site of a year ago had been filled in with a number of spanking new buildings lined along the street with what appeared an exacting precision. The photo to your right shows roughly the same space in September 2016 as was shown in the August 2015 photo above. A year ago, 42nd Street was an empty, slightly soiled, commercial industrial hub. But on my visit this year the street took on a wholly different appearance with the new buildings / storefronts. 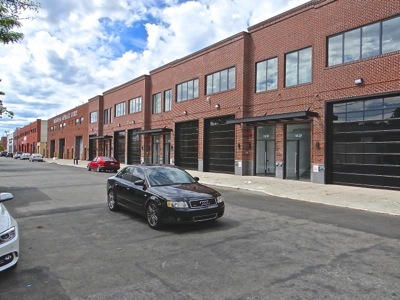 There were eight new buildings along 42nd Street, with red brick exteriors complemented by black trim and large floor-to-ceiling paned storefront windows, which I believe could also serve as garage doors. It almost seemed like these new edifices could as easily become art galleries, as manufacturing locales and / or storage facilities. Click here to read the rest of our report about the Steinway Mansion real estate development in Northern Ditmars, Astoria. January 5, 2015 / NYC Neighborhoods & History NYC / Gotham Buzz NYC. March 12, 2014 / NYC Neighborhoods & History NYC / Steinway Mansion History & Steinway Hall NYC / News & Opinion / Gotham Buzz. Well, the saga is almost over. NYC and Queens government officials are about to let slip into private hands, the greatest historical relic of the 1800's in Queens. And what could have been - and could still be - one of the greatest historic sites / historic tourist attractions of Queens. The Steinway Mansion is under contract to be purchased by a private buyer. It's not that Queens and NYC government officials haven't had a chance to save it. 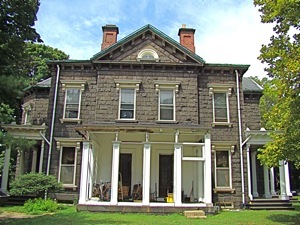 The historic mansion, which was landmarked for its historic signficance decades ago [landmarking prevents changes to outside of the structure], came on the market in August of 2010. The asking prices has been between $2 and $4 million, which given that far smaller homes with no significance are already selling for over $1 million in the Astoria neighborhood, it seemed like a reasonable asking price. Click here to read the rest of our report about the Steinway Mansion Under Contract. The story includes photos and links to other stories we've done over the years about the Steinway Mansion and it's inhabitants and their endeavors. The story also includes the business case for taking the Steinway Mansion public and transforming it into a museum / cultural destination for all of Queens, NYC & the world. 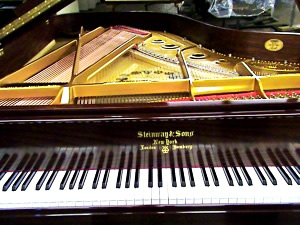 July 23, 2013 /Astoria / NYC Neighborhoods & History NYC / Steinway Mansion History & Steinway Hall NYC / News & Opinion / Gotham Buzz..
Click here for the rest of our report about the proposed sale of the Steinway & Sons Piano Company / Steinway Musical Instruments. Will The Historic Site In Astoria Be Next? April 23, 2011 / NYC Neighborhoods & History NYC / Gotham Buzz NYC. I attended the Steinway Mansion contents auction on Saturday, March 27th, down at Capo Auction on Queens Blvd in Long Island City. 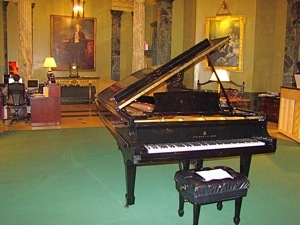 It was the first of two auctions wherein the contents of the Steinway Mansion, collected over a lifetime by Michael Halberian, were to be auctioned off. 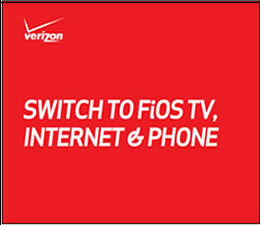 The second auction is Saturday, April 30th starting at 11 am and going well into the afternoon. On March 27th there were over 600 items auctioned, where bidding started in the hundreds to thousands of dollars. In addition to the hundred or so buyers who appeared at the auction house, bids were also taken over the internet. 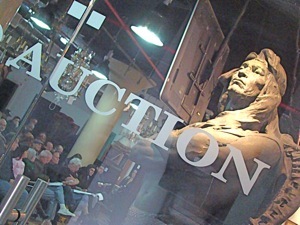 The photo to your right is of the Indian statue that once stood on the grounds of the Steinway Mansion, with the bidders shown through the doors while the auction was in session in March. 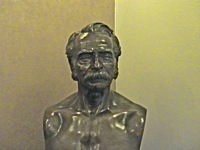 April 2011 / NYC Neighborhoods & History NYC / Steinway Mansion & Historic Houses in NYC / Gotham Buzz NYC. The importance of William Steinway on New York City's and Queens development is quite remarkable. He was a Commissioner of the NYC Transit while it was working underground subway lines, he was the first to start digging tunnels underneath the East River, Steinway Hall preceded Carnegie Hall which was the forerunner to establishing New York City as a cultural center, he once owned the land that would one day become LaGuardia Airport, and he was politically connected as a good friend of president Grover Cleveland ... oh, and one of the founding family members of Steinway & Sons Piano Company which continues to operate a plant in Astoria over 150 years later. The Smithsonian Institution in Washington DC initiated a project spanning more than ten years during which more than 2,500 pages of William Steinway's Diary was put online. About 40 people came up to view the mansion in March of 2011. If the Smithsonian Institution thinks the Steinway Mansion is historically significant, shouldn't we at least explore options to aquiring the mansion? The photo at right shows a page from the Steinway Diaries which are on display at the Smithsonian in Washington, D.C. 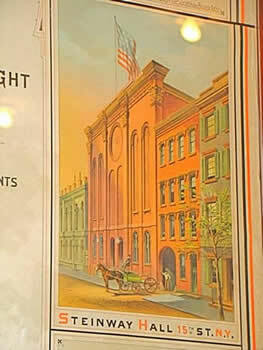 The Greater Astoria Historical Society aided the Smithsonian in gathering information for the exhibit. The Steinway Mansion was built by Benjamin Pike Jr. Benjamin Pike Jr. was a ingenious businessman and one of the first marketers in this country to sell scientific instruments by catalogue. 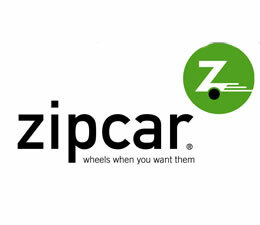 He made a fortune selling the latest technology, much of which was imported from England and France, but through which pioneers could obtain telescopes, microscopes, surveying equipment and a whole range of other instruments, including batteries, projectors and magnetic instruments used for medical and health purposes. 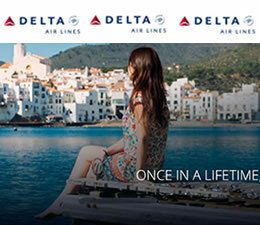 Look at the house in the photo to your right. The Steinway Mansion is the most significant and one of the last, if not the last of the 'country mansions' still standing in Queens. Do you really think we should allow this historic site to be gutted and turned into corporate offices? The Steinway Mansion has the potential to become a magnet through which tourists might begin altering their vacation plans to explore NYC’s most diverse borough. From the Dutch Kills / Queens Plaza subways [the public transit connection for these hotels], the Steinway Mansion is about a seven minute subway ride and a 15 minute walk. NYC & Queens officials could leverage the Steinway name, to lure tourists ever so briefly into the borough of Queens. And then let the residents, restaurants, shops and other cultural attractions of Queens work their charm on these intrepid travelers. Queens currently gets very little of the tourist dollars spent by a portion of the 48 million visitors who come to NYC. Isn't it time we begin to claim a small portion of our rightful share? But at present there isn’t anything being done to acquire the Steinway Mansion. Everyone is for saving it, but nobody does anything. 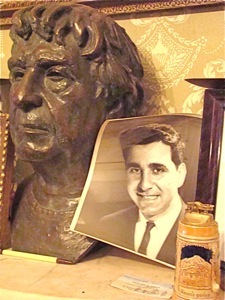 The collection of historic artifacts collected through a lifetime by the late Steinway Mansion owner, Michael Halberian, began auction on March 26, 2011 and will be completed on April 23rd at the Capo Auction House on Queens Blvd in Long Island City. What’s interesting to me is that Queens has the opportunity to capture a share of the NYC tourism market by luring a portion of the tens of thousands of hotel guests who will stay overnight at these Queens hotels. One of the investments Queens and NYC government officials seem reluctant to explore, let alone actually do, is to develop a plan to transition the Steinway Mansion [and by association the Steinway Piano Factory, Steinway Street and the Ditmars area] into an important NYC tourist destination. I’ve personally spoken to nearly all relevant government officials including the Mayor, Queens Borough President, City Council Members, and NYS and U.S. Representatives. So far there's been a lot of verbal support and no concrete action. December 7, 2010 / NYC History & Neighborhoods / Gotham Buzz NYC. April 17, 2011 / Astoria / NYC Neighborhoods & History NYC / Steinway Mansion History & Steinway Hall NYC / Gotham Buzz NYC. February 19, 2011 / Astoria / NYC Neighborhoods & History NYC / Steinway Mansion History & Steinway Hall NYC / Gotham Buzz NYC. 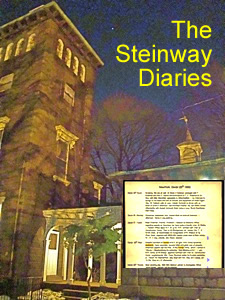 On Monday, March 7th at 7 pm the Greater Astoria Historical Society will be hosting the Smithsonian Institution’s presentation of the William Steinway Diaries. These diaries are a first person account written by one of the most influential people in the emerging American metropolis of New York City in the latter half of the 19th century. The diaries begin in 1861 around the time of William Steinway’s first wedding [and the beginning of the American Civil War] and continue throughout the rest of his life, terminating only weeks before he died in 1896. I had the opportunity to talk with Bob Singleton, Executive Director of the Greater Astoria Historical Society in anticipation of the Smithsonian Institution’s presentation of the Steinway Diaries on March 7th. He took me through some of the interesting things to investigate using the online project that was the Smithsonian’s “largest and longest-running volunteer research efforts”. 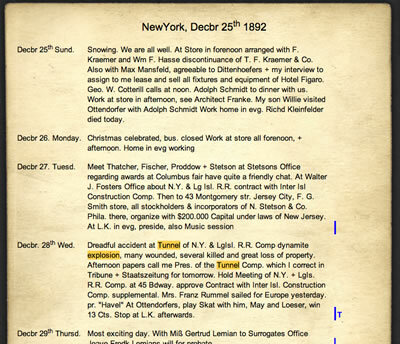 A copy of one of the transcribed pages from the Smithsonian's Steinway Diaries website is shown inset in a photo of the Steinway Mansion in Astoria. The general public is welcome to the March 7th presentation, and it is highly recommended that you purchase / rsvp tickets in advance. Click here to read our look into the William Steinway Diaries. December 30, 2010 / Astoria Queens / NYC Neighborhoods & History NYC / Steinway Mansion History & Steinway Hall NYC / Gotham Buzz NYC. Michael Halberian, owner of the Steinway Mansion in Astoria, died Monday evening around 7 pm. We have unofficial reports that he died of cardio obstruction pulmonary disorder. Michael turned 83 in November. Michael is survived by two children, Michele Kazarian and John Halberian [wife Stephanie]; his sister, Rosemary; five grandchildren including Jackie and Katie Kazarian and Christopher, Meg and Jack Halberian; and neices and nephews. Services will be held at 2 pm at the Armenian Church of the Holy Martyrs in Bayside. The church is located on the corner of Horace Harding Expressway [LIE] and Oceania Boulevard. Click the links below to learn more about the life of Michael Halberian and the historical Steinway Mansion for which he so loved and cared. Michael is shown standing in front of the Steinway Mansion in the photo above circa the 1930's. Click here to go to the Michael Halberian Obituary or click this link to go to the Steinway Mansion series section of this site. October 20, 2010 / Astoria / NYC Neighborhoods & History NYC / Steinway Mansion History & Steinway Hall NYC / Gotham Buzz NYC. 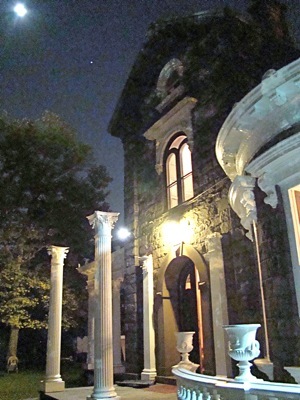 It was a cool quiet moonlit evening as I made my way down the lonely street leading up to the Steinway Mansion. As I passed through the century old Italian wrought iron gates, I found white Japanese paper lanterns lit by candles leading into the yard. I followed them around the side of the house, and eventually right up to the front porch. But I couldn't go in, at least not yet. The mansion looked so serene and quiet, even as over one hundred people enjoyed the cocktail party going on inside. The grey granite exterior soaked in the silvery moonlight, as the white trim glowed luminously. I stood there for a while, just breathing in each moment ... until someone came up behind me and said, "We really should buy this for ourselves." We then laughed, knowing that that would never happen. But there was a yearning in my heart that the Steinway Mansion would be bought by some level of government, so that I, along with everyone else in Queens, could continue to enjoy this beautiful home, for the rest of our days. It dawned on me later, that perhaps I'd caught the Jack Halberian fever, and fallen in love with a 19th century Queens home and legacy that have no peers. Click this link to view this report, along with quite a number of photos taken at the cocktail party dedicated to a Steinway Mansion open house / for sale. October 7, 2010 / Astoria / NYC Neighborhoods & History NYC / Steinway Mansion History & Steinway Hall NYC / Gotham Buzz NYC. What an evening! It started with an interesting journey through some of the Steinway & Sons history by local historian Bob Singleton and was followed by a rousing speech by City Council Member Peter Vallone. 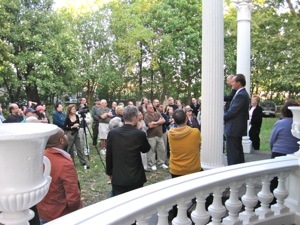 Then the mansion was opened up to some 70 or 80 people who had been invited to ‘Help Save The Steinway Mansion’. The photo to your left shows Peter Vallone and historian Bob Singleton standing on the steps of the Steinway mansion talking to community members who wish to preserve the Steinway mansion. It's been said that President Grover Cleveland visited this historic treasure in the 1880’s as a guest of Henry Steinway. And Mayor Ed Koch made a visit to the Steinway Mansion as guest of Michael Halberian. Click here to read more about Mayor Bloomberg’s invitation to the Steinway Mansion in Astoria later this month. Updated October 2, 2010 / NYC Neighborhoods & History NYC / Gotham Buzz NYC. On Friday, September 17th, City Councilman Peter Vallone visited owner Michael Halberian at the Steinway Mansion which is currently up for sale. 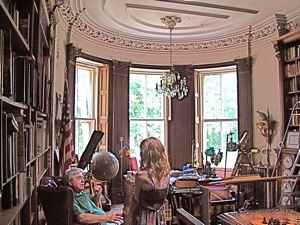 According to Kim Parshley, one of the realtors handling the sale of the home, Peter was so impressed by the historic significance of the mansion and the countless historic artifacts pertaining to NYC collected by Halberian, that he has made a request to the city to purchase the site for posterity. On September 30th City Councilman Jimmy Van Bramer, who represents nearby Sunnyside publicly supported the measure and followed up by sending a letter of his own to the Mayor, urging the Steinway Mansion purchase. 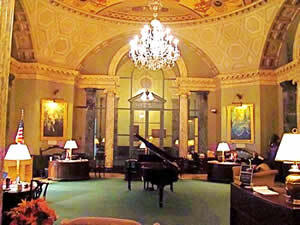 Click here to read our first report on the history of the Steinway Mansion. Fall 2010 / NYC Neighborhoods & History NYC / Gotham Buzz NYC. The Steinway Mansion is up for sale. It was built in the 1850's, is made of granite, has 27 rooms on four floors [counting the crows nest or basement] and contains over 150 years of Queens and NYC history. 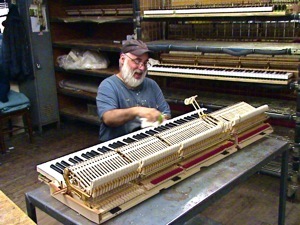 The Steinways of Steinway Piano & Sons were leading Queens citizens who at one time owned the property that is now LaGuardia Airport, began a tunnel under the East River that is now the tunnel for NYC subway lines, and essentially put the neighborhood of Astoria on the map via their piano factory company town. The Steinway Mansion is already a landmark. 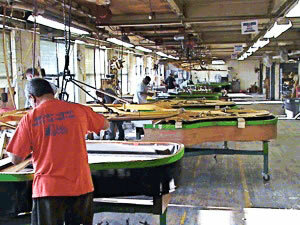 The Steinway piano factory already attracts hundreds, if not thousands of visitors annually. Purchasing this landmark would not only preserve an important piece of our history, but also has the potential to increase tourism in Queens by enhancing its attractiveness as an historic and cultural center - all of which is also good for commerce. 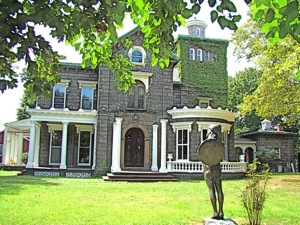 Click this link to read our report / view our photos of the Steinway Mansion For Sale in Astoria Queens. 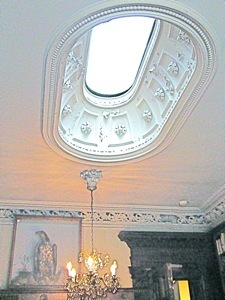 The photo above is of a skylight in the study of the Steinway Mansion. Please email City Councilman Peter Vallone at vallone4ny@gmail.com and Jimmy Van Bramer at jvanbramer@council.nyc.gov to let them know you support their efforts to Save The Steinway Mansion. Please copy the following government officials on the email: Councilman Daniel Dromm at dromm@councilnyc.gov; City Council Speaker Christine Quinn at quinn@council.nyc.ny.us and Queens Borough President Helen Marshall at info@queensbp.org. You may also call 311 to register your interest in having the Steinway Mansion preserved by the city for the people of Queens and everyone else. August 20, 2010 / NYC Boroughs Neighborhooods & History NYC / Gotham Buzz NYC. On Wednesday afternoon I set to work on this story after returning from a fascinating four hour visit with Michael Halberian, owner and whose family occupied, the Steinway Mansion for the past 82 years. 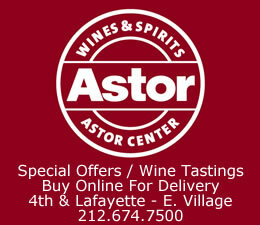 The mansion is located in Astoria, just north of 19th Avenue on 41st Street [map link provided at end of story]. January 13 & 22, 2009 / Steinway & Sons Piano Factory History / NYC Neighborhoods & History NYC / Gotham Buzz NYC. I had the opportunity to take a wonderful trip back in time without even leaving the borough. I traveled through a time warp, back into 19th century American, when technology was merging with craftsmanship to create the foundations of the modern world we lived in throughout the better part of the 20th century. In 1875 Steinway & Sons bought 400 acres of land in what used to be Long Island City prior to its merger with Manhattan and Brooklyn to form New York City. 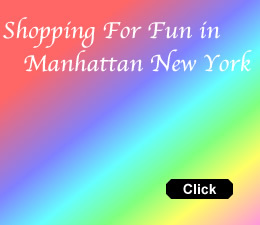 The factory is located at the northern tip of Astoria Queens, as one would guess, near Steinway Street. Tours are given weekly throughout the school year but cameras are not allowed. We started the tour in an upstairs conference room where there’s a plaque showing the piano was invented in 1711 by Bartholomew Cristofori [d. 1731]. He modified the plucking of strings, as is done by the harpsichord, to create the piano, which strikes the strings. The piano is both a percussion [striking] and stringed instrument. Heinrich Steinway, the company’s founder was born in Germany. 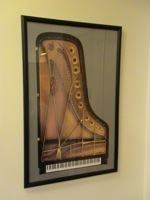 He grew up in the furniture making business and he began applying those skills to piano making in the early 1800’s. 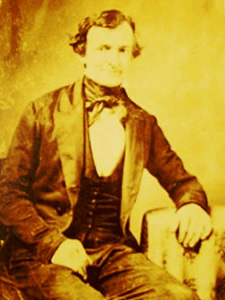 In 1849, one of his sons came to America, and a year later most of the rest of the family followed. 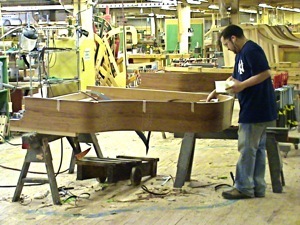 Click here to read the rest of our story, including photos of the Steinway Factory History & Tours in NYC.